A Honduran TV star turned opposition candidate on Sunday called on the country’s military to rebel from enforcing a curfew that was imposed after deadly protests over last week’s disputed presidential vote. 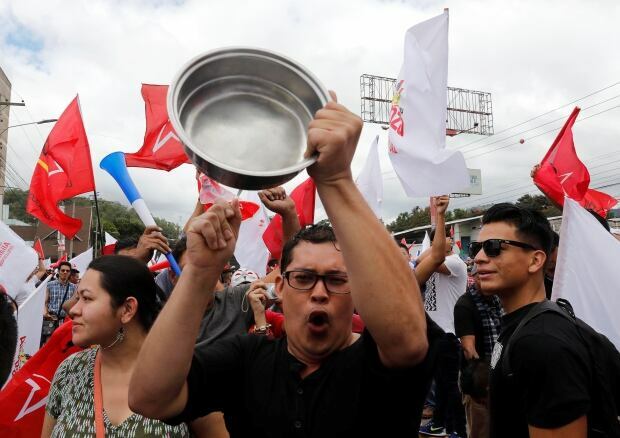 Thousands of mostly young demonstrators banged pots and blew shrill horns as they marched through the capital, Tegucigalpa, in support of Salvador Nasralla. He accuses the government of trying to steal last week’s election. Local TV images showed similar protests in other major cities around the country. Early last week, Nasralla, a former sportscaster and game show host, appeared to have pulled off an upset victory over U.S.-backed President Juan Orlando Hernandez before the vote count stalled without declaring a clear winner. Both Hernandez and Nasralla have claimed victory. Nasralla had been leading in the count until a lengthy delay interrupted reports from electoral officials, feeding opposition complaints of irregularities. Officials blamed the pause on technical problems and denied any manipulation. Electoral authorities said on Sunday they would announce a winner soon, once they concluded a partial recount. Addressing protesters from an intersection near where the vote count was taking place, Nasralla called on the armed forces to disobey their leaders and urged his supporters to continue peaceful protests. “I call on all members of the armed forces to rebel against your bosses,” Nasralla told a cheering throng of supporters who booed nearby troops. “You all over there, you shouldn’t be there, you should be part of the people,” he said. Hundreds have been arrested in violent protests that have left at least three dead after the tally from last Sunday’s presidential race stalled without a clear winner. The electoral tribunal said it was reopening the tallying of votes from 1,031 ballot boxes in which inaccuracies were detected. Nasralla and supporters of his leftist Alliance of Opposition Against Dictatorship have called for a far broader recount. The Organization of American States on Sunday said in a statement that the tribunal should not stop with the limited recount. It said Nasralla’s demand to recount more than 5,000 polling stations was doable. “I have asked them to repeat the elections, but only those for the presidency, with the aim of resolving the crisis that Honduras is suffering,” Nasralla said Saturday. He said a new election “would be under the supervision of an international electoral tribunal, not the local one, because there aren’t sufficient conditions to guarantee” the vote would be fair. “Even the nationalists know this was a big fraud. The recount is useless. They know that the president lost,” said Carlos Hernandez, 24, before approaching a group of soldiers along the protest route and yelling at them for supporting the government. Following violent protests, the government imposed a 6 p.m. to 6 a.m curfew on Friday, expanding powers for the army and police to detain people and break up blockades of roads, bridges and public buildings. 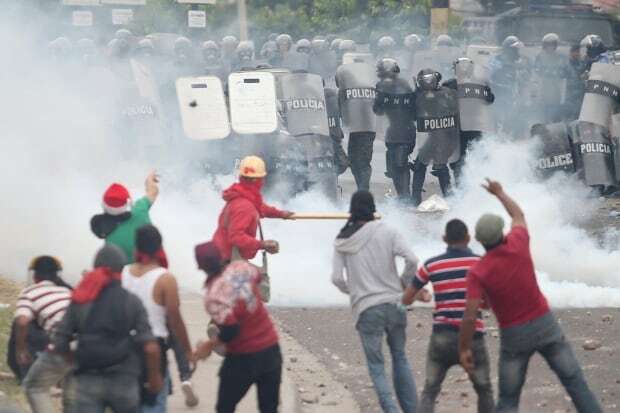 The protests were reminiscent of those following the 2009 coup that ousted former President Manuel Zelaya, whose Libre party is the key partner in the coalition led by Nasralla that formed in a bid to unseat Hernandez. Social media showed Hondurans across the country banging pots and pans in their homes and in the streets at night in protest over the curfew. The Central American country struggles with violent drug gangs, one of world’s highest murder rates and endemic poverty, driving a tide of Hondurans to migrate to the United States. “We cannot continue with this president. We are afraid to leave our houses. We want to study and have a future that is not just going to the United States or being killed by gangs,” said Marilyn Cruz, a 27-year old law student, who joined the protests on Sunday. 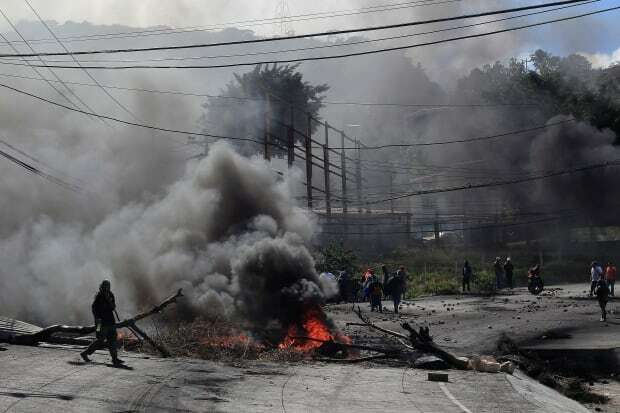 Since late last week, at least three people, including a 19-year-old woman, have been killed in the demonstrations as soldiers busted up protesters’ blockades of rubble and burning tires, according to a national police spokesperson. Showing support for Nasralla from Venezuela, the leftist president Nicolas Maduro — who rules by decree and has been called a dictator by U.S. officials — said Sunday the U.S. is behind the election fraud. Hernandez, 49, implemented a military-led crackdown on gang violence after he took office in January 2014 that was backed by the United States. He has been supported by U.S. President Donald Trump’s chief of staff, John Kelly.